I'm writing you from the comfort of a cozy couch in Thomas' childhood home in Norway. It's 8:30 AM and it's still pitch black dark outside - However the snow covering the ground and trees illuminates the sky, the Christmas tree is twinkling, and the wood burning stove is providing maximum coziness. We arrived yesterday at 11:30 AM after traveling for over 30 hours from Portland to Orlando and then finally landing in Oslo. Sitting here now the sleep deprivation is 100% worth it. Being from Florida, I am use to Christmas being over 75 degrees and going outside in teeshirts and shorts - so this white Christmas is a whole new phenomenon to me. The past two times that I've been to Norway our schedules are always packed every-day with side trips, visits with friends, and a constant rotation of activities which I normally love. However, this trip is total opposite and we have NOTHING planned which is a breath of fresh air. We are so excited to relax, visit with family, and do things as they come-up. Obviously a lot of good food is the only thing secured on our agenda. I'm so excited for Norwegian Christmas food like pinnekjøtt, ribbe, kålrabisteppe, and washing it all down with Akevitt. Don't worry, I'll post pictures of all of that so you don't have to Google it! With all of this cold weather, I have been loving comforting dishes like this steel-cut out "risotto". 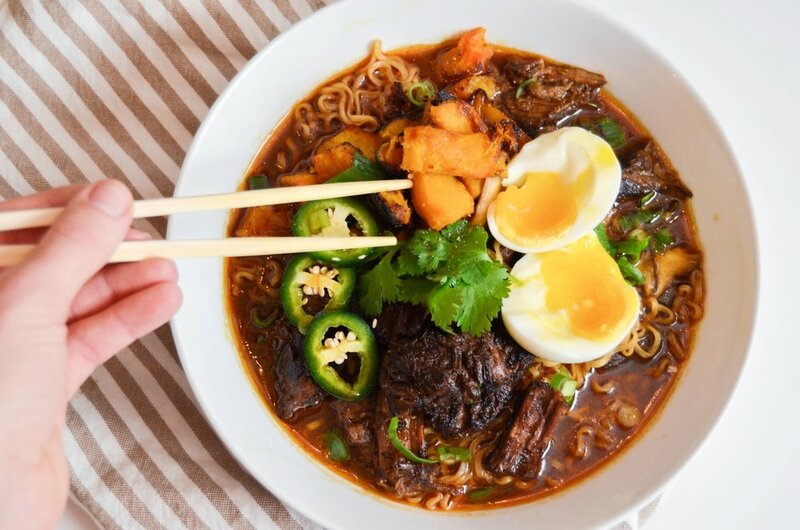 I am obsessed with this recipe because it's healthier and more fibrous than the traditional rice-y version. I got the inspiration from Cookie and Kate and jazzed mine up with fennel and delicata squash. 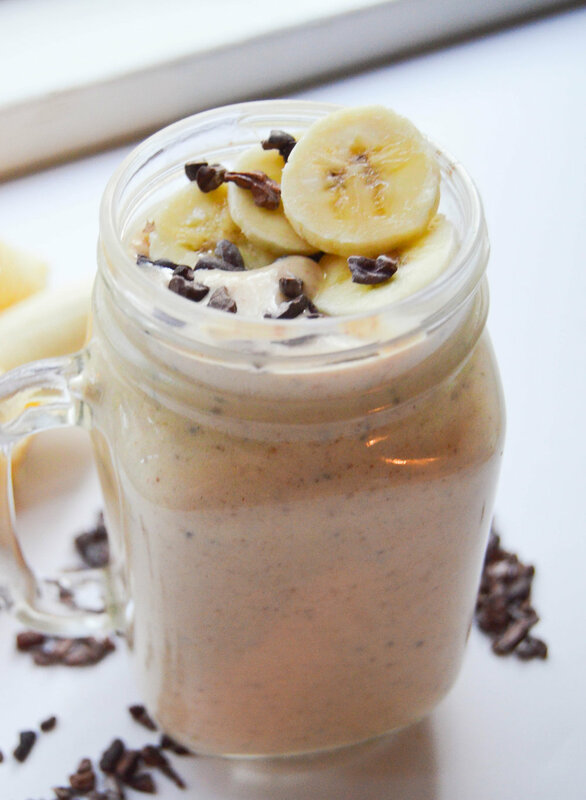 SO filling, SO creamy & rich, SO good. I hope everyone gets to spend the next few days with your loved ones and filling your bellies with lots of yummy things! In a medium Dutch oven or soup pot, warm the olive oil until shimmering. Add the onion, fennel, squash, ½ teaspoon of the salt, and the red pepper flakes. Cook, stirring often, until the onion and fennel are translucent and the squash is mostly tender, about 8 to 10 minutes. Add the garlic and stir to combine. Add the oats and kale and cook, stirring often, until the kale has mostly wilted, about 2 minutes. Add the wine and use a wooden spoon or silicone spatula to scrape up any browned bits that have formed against the bottom of the pan. Cook, while stirring, for another 1 to 2 minutes. Add the water and remaining ½ teaspoon salt. Raise the heat to high and bring the mixture to a simmer, stirring occasionally. Once simmering, reduce the heat to medium-low and simmer, stirring occasionally, until the mixture is very creamy and thick, about 20 to 30 minutes. As time goes on, you might need to stir more frequently and reduce the heat to prevent scorching the bottom. Remove the pot from the heat and stir in the Parmesan, butter, lemon juice and several twists of black pepper. Let the risotto rest for 5 minutes before serving. Once you’re ready to serve, season generously with additional salt (I usually add at least ¼ teaspoon), and black pepper. Add an extra squeeze of lemon juice if it needs an extra boost of flavor. Divide into bowls and serve. What a weekend!! My birthday is actually today, but I spent the weekend being spoiled by the best fiancé and friends ever. On Saturday I woke up to flowers and the most incredible eggs benedict. Then Saturday night we had the best date night and went to Ox. Greatest meal I've eaten in Portland so far. I'm telling you, if you live in Portland or are traveling to Portland you have to try this gem! We had the clam chowder with smoked marrow bone (SOOO GOOD), the most tender skirt steak, braised lamb, the yummiest carrots with truffled pistachios and goat cheese, crispy brussel sprouts, and wine. Lots and lots of wine. We finished the night talking for hours at the coziest little wine bar by our apartment that we always pass and say "we should check it out someday". I couldn't have asked for a more perfect date night. Then on Sunday, my girlfriends took me to brunch at Petite Provence and we sipped mimosa flights, ate crepes, croissants, and French baked eggs and talked and laughed about anything and everything. It was the best day and if you haven't seen a trend I obviously am happy celebrating with food! So now we've arrived to Monday and we're leaving for Norway in two days!! I feel like I have so much to do between now and then, but I'm so excited to get there and spend the holidays with Thomas' family. I can't wait to cozy up on his couch with the wood burning oven crackling and watching the snow falling outside the window. The only way to make the scene better which sounds impossible, is to be sipping on homemade hot chocolate. Believe me, I've had my fair share of cocoa packets in the day, but there is nothing better than to make homemade hot chocolate with homemade whipped cream. I love anything with a touch of salt, so adding local Jacobsen Salt to the hot liquid gold made it 10X better. Chop chocolate into small pieces. The smaller they are, the faster and more smoothly they will melt. Optional: If using cornstarch, whisk with ½ cup milk and set aside. Heat milk, sugar, and salt in a saucepan over medium-low heat. Stir occasionally. When milk begins to bubble around the edges, stir in chocolate and whisk until smooth. Add cornstarch mixture and any other add-ins. Whisk until smooth and steaming hot. 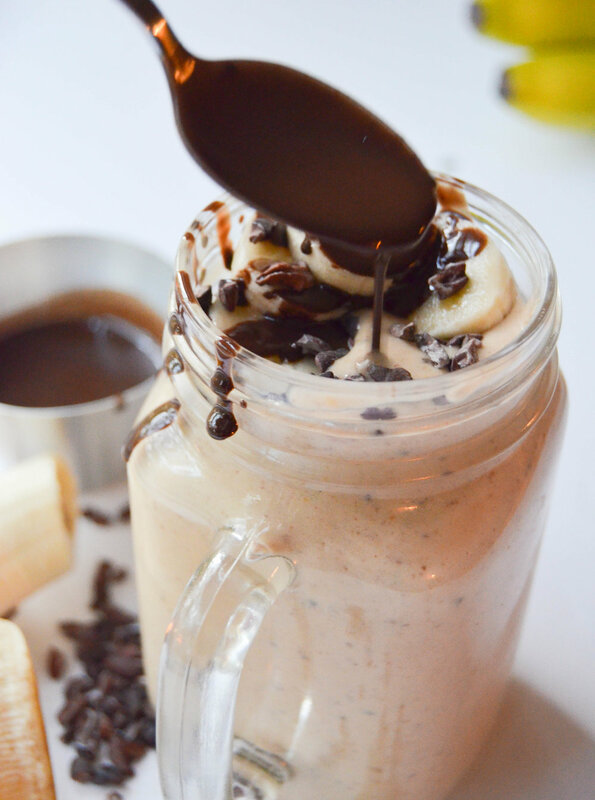 Pour into cups and top with homemade whipped cream and chopped chocolate. Place the sugar into the mixing bowl and add the whipping cream. Whisk just until the cream reaches stiff peaks. Store any unused portion in an airtight container for up to 10 hours. When ready to use, rewhisk for 10 to 15 seconds. How is everyone's pre-thanksgiving weekend?! Prepping the meal for the big day? Or maybe you're just prepping your tummies and not doing any cooking at all. Whatever floats your boat! I'm currently writing from the Atlanta airport after my work training, getting ready to board to head back to Portland. We are literally turning right back around and heading back to Georgia on Tuesday to spend a few days at the cabin for Thanksgiving with the fam. I feel like from the moment we get to the cabin for Thanksgiving it's non-stop eating. You would think that we would eat lightly before the big meal on Thursday but nope - not the case. It's literally fried chicken, fried fish, or fried venison the night before (something is bound to be fried), always fresh baked cookies coming out of the oven, and big breakfasts every morning! I am definitely making these adorable breakfast skillets this year for the fam! They are SO darn good. 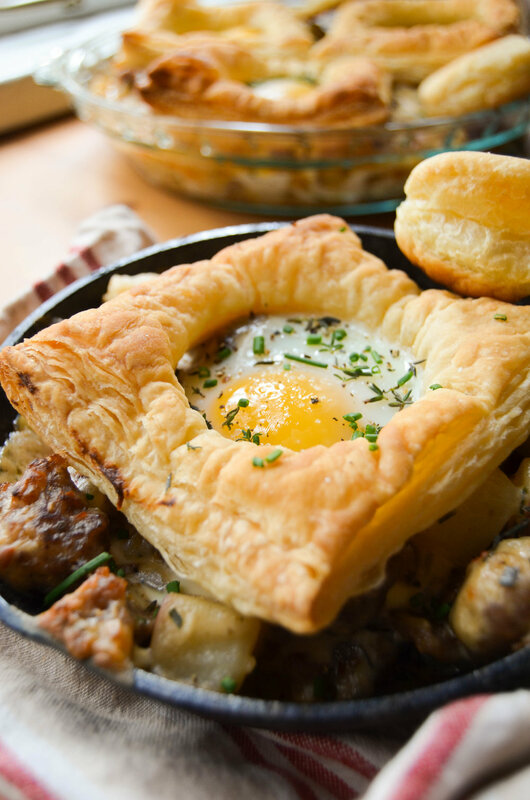 It reminds me of my moms biscuits and sausage gravy, but these are just jazzed up a little with puff pastry and a sunny side up egg! 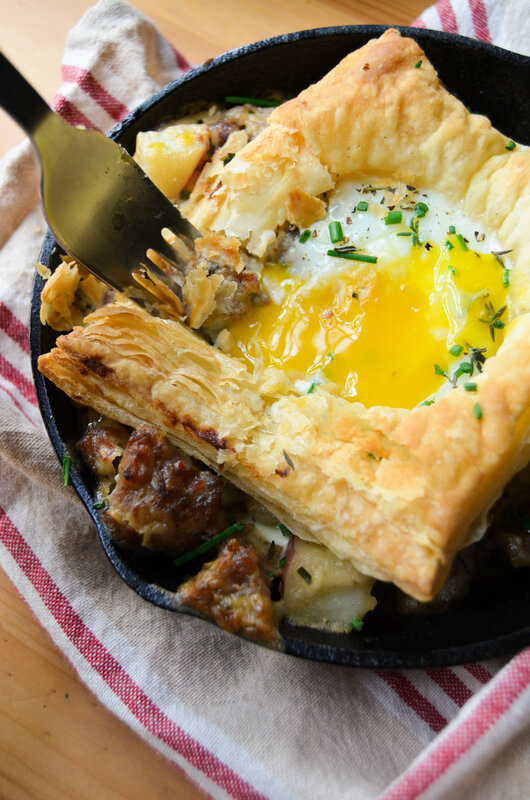 The creamy, sausage-y richness from the gravy, combined with flaky pastry and a runny egg yolk is something out of breakfast heaven. I had only one little cute cast iron skillet, but if you have enough you can make everyone individual ones, or you could do one big skillet or casserole dish. 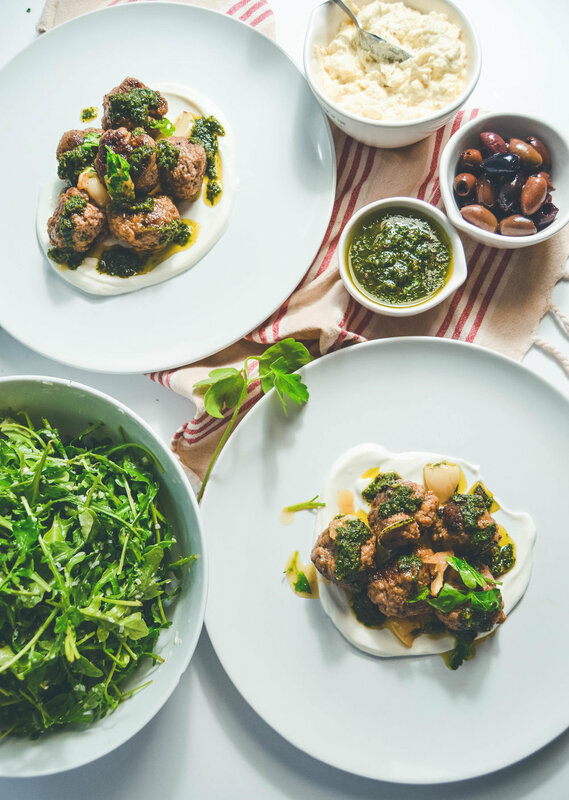 This time of year is the absolute best to sit around with your family, sharing good food and make memories together. Note: This is to feed 8, so if you only want to feed 4 cut the recipe and half and only cut holes out of 1 puff pastry sheet. Sausage gravy filling: Place a large skillet over medium-high heat and brown/crumble sausage, about 4 minutes. Transfer sausage to a mixing bowl and set aside. Drain grease from skillet, add butter and melt over medium heat. Add potatoes and onion and sauté for 6 to 8 minutes or until potatoes turn tender and onions lightly soften and caramelize. Season with salt and pepper. Add garlic and continue to sauté for 2 to 3 minutes. Stir in herbs. Sprinkle flour over mixture and stir together for about 2 to 3 minutes. Slowly stir milk into the mixture and continue to stir until gravy is smooth and mixture is thick enough to coat the back of a wooden spoon. Add more milk in this process if it's too thick. Fold sausage back into the gravy mixture and adjust seasonings. Set aside and keep warm. Puff pastry topping: Cut thawed puff pastry sheet down the middle, both vertically and horizontally, so you have 4 even rectangles on each sheet. Using a 2 1/2 inch circle cutter, cut a circle out of each piece of puff pastry. Place each rectangle, plus cut circle onto a parchment lined baking sheet and bake for about 10 minutes. To assemble: Divide the filling mixture amongst skillets/ or big skillet. Remove pre-baked puff pastry rectangles from the baking sheet and set each one over a gravy filled skillet and gently press. Crack an egg into the cut out circle of each pastry rectangle and place skillets onto the baking sheet (circles of puff pastry should still be on the tray). Place baking sheet back into the oven and reduce temperature to 375˚F. Bake for 15 to 20 minutes or until the puff pastry is golden brown and the egg whites have set, with the yolks still runny. Lightly season with salt and pepper, top with minced thyme and serve. It is chilllly in Portland folks. It's dropped down in the 40's, all the leaves are starting to fall, and Starbucks already has their Christmas cups out. WHAT IS THIS CRAZINESS?! Wasn't it just summer? Regardless, I am so excited for the fact that Thanksgiving is in a little over two weeks and Christmas is right around the corner! I am forbidding myself to not start listening to Christmas songs until after Thanksgiving though. I had the itch to turn on holiday jams today but I restrained myself. Two whole months of listening to Mariah Carey is just a tad much. With the cold weather brings lots of staying inside and cooking up yummy things which makes my heart happy. I have loved seeing all of the beautiful Thanksgiving recipes start to come out from other bloggers! Thomas and I are having a mini Thanksgiving for ourselves this weekend, so I'm excited to share what we come-up with for you! 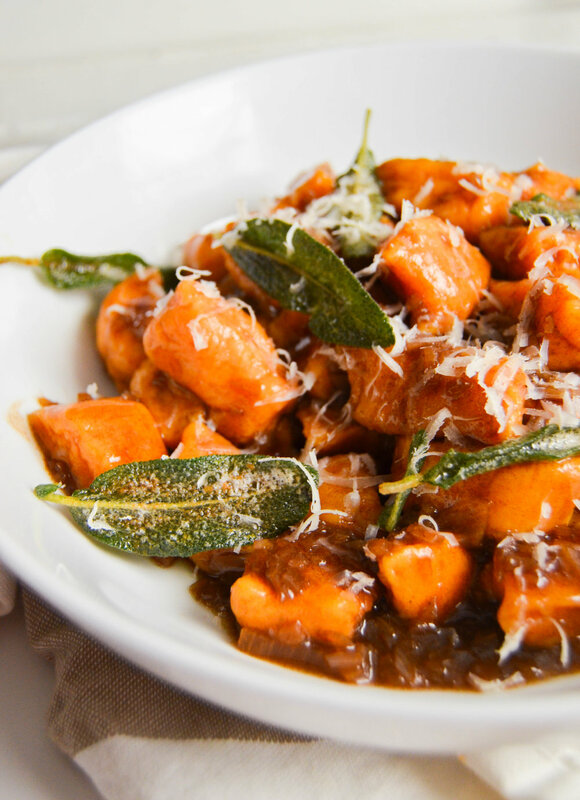 But now can we talk about these little pillows of sweet-potato gnocchi heaven? MIND BLOWN. The last time I had good gnocchi was in West Hollywood with my friend Paige at Laurel Hardware. They were so freaking soft and pillowy I thought it would never be possible to make gnocchi as good at home. Well my friends, I was wrong. This recipe is simple, delicious, and is the perfect Fall/Winter pasta dish. They are tossed in a balsamic brown butter and topped with crispy sage and grated parmesan- I mean seriously. Permission to do a swan dive into that please? For the gnocchi: Heat an oven to 425°F and arrange a rack in the middle. Drizzle potatoes with olive oil, season with a few good pinches of salt and a few cranks of pepper, place on a baking sheet cut-side down, and roast until fork tender, about 30 minutes. Set aside until cool enough to handle. Scoop flesh out of skins then mash with back of a fork) and stir in cheese, egg, honey, and the 2 teaspoons of salt. Mix in flour, about 1/2 cup at a time, until soft dough forms. Taste and add additional salt, as needed. You've added enough flour when you touch the back of the dough and it is damp but not sticking to your hand. Turn dough out onto floured surface and shape into a square. Divide the dough into 16 equal pieces. Rolling between palms and floured work surface, form each piece into a rope (about 1/2 inch in diameter), sprinkling with flour as needed if sticky. (However, don't add too much additional flour, as too much will make for heavy gnocchi.) Cut each rope into 1/2 -inch pieces. Stop here or, as desired, using your thumb, roll each piece down over the tines of a fork to indent. Bring a large pot of heavily salted water to a slow boil over medium-high heat. Working in batches, simmer gnocchi until they float then cook and additional 30 (if fresh) to 60 seconds (if frozen). Using a slotted spoon, transfer gnocchi to a clean rimmed baking sheet. Reserve 2/3 cups of pasta cooking water and drain the rest. For the sauce: Meanwhile, in a large frying pan, melt the butter over medium heat. Once it foams, add sage and cook until crisp and fragrant. Remove sage to a plate and return frying pan to stove. Add shallot and, watching it carefully and stirring often, allow the solids to begin to brown and the butter to become fragrant and nutty. Scrape along the bottom to prevent the solids from sticking and burning. When the butter is brown, immediately remove from heat, and carefully stir in the vinegar (otherwise it may sting your eyes). Stir in pasta and 1/2 cup of the reserved pasta water, return to heat, and cook until just coated in the sauce. Add freshly ground black pepper, taste for seasoning and finish with additional pasta water, salt, black pepper, the crisp sage, and freshly shaved Parmigiano-Reggiano.